This device is used as a reminder to take medicine every day. This device actually contains a crystal watch and a 4001 quad 2-input NOR gate with two of the gates (IC1a & IC1b) wired as an RS flipflop. The watch is set to "tablet time", usually mornings, when an alarm is activated with a high signal fed via diode D1 which sets the RS flipflop and enables the oscillator comprising gates IC1c & IC1d. This drives the LED with a 10% duty cycle. The 10nF capacitor resets the watch alarm when positive voltage appears on pin 3 of IC1. 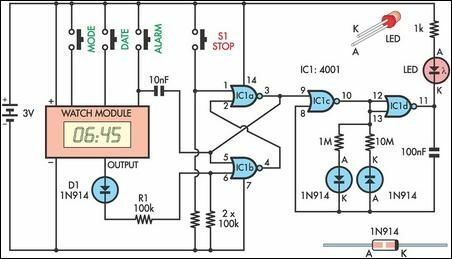 The circuit consumes only 50µA with a 3V battery.